I want to preface this by saying I wrote this review back in September, and have been waiting for the write time to post it. I figure now is the time, since Oprah.com ran an article by the author, Pamela Ribon, back and June - which has just popped back up in some of my derby circles..
What's interesting is that I did't 100% love this book (read my thoughts below), but I completely loved her article on Oprah's website. The book is not primarily about roller derby, and I had a lot of trouble relating to it. On the other hand, her Oprah article is well written and, in my opinion, completely universal in the roller derby world - which makes me feel a little bit better about not 100% loving something having to do with roller derby. Definitely read the article... and maybe check out the book too. 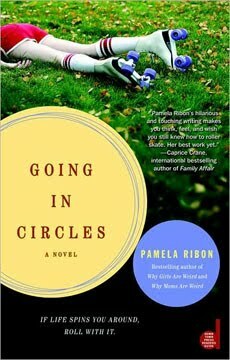 On the recommendation of a fellow derby girl, I checked Going in Circles, by Pamela Ribon, out of my local library and snuggled up with a book for the first time in a while. I haven't written a book review in a long time (middle school?) so forgive me if I do it wrong. I won't give away the ending at least. This book is not about roller derby... primarily. In fact, the first third of this 300 page book doesn't mention it at all. This book is about a woman in her 30s going through a divorce. And frankly, I found the first part depressing. I know divorce is a fact of life, and that's probably the point of the book, but when I was expecting to read about derby, it kind of threw me off. A group of women peel off and stomp to the track together. Two other women wait a few feet behind them. A whistle blows, and the women in front all start skating. That's the word for what they're doing, but it doesn't describe what's happening. It's more like an attack, like an army on the move. The whole chapter perfectly describes the experience of roller derby to the uninitiated. To the confusion/horror of the knocking around, to the grateful observation of the pads and other safety gear. Charlotte ultimately joins the team and earns the nickname Hard Broken. The story takes place in Las Angelos with a banked track team. Nevertheless, her endeavors from learning to skate, to making friends on the team, to dealing with life outside of derby, are things every derby gal can relate to. And there are some pretty funny scenes. Her interactions with her wannabe derby wife, Francesca, are constantly heartfelt and/or jocular. What's difficult about getting through the book is Charlotte's constant struggle over her divorce. Throughout the story, via Charlotte's odd mental flashbacks, the reader learns more about her not-so-perfect-afterall with her lame almost ex-husband. These asides are often just stressful to read through, because Charlotte is so distraught over it all. But luckily she has roller derby, and luckily this book plays that up a bit more in the end so all the excited derby girls (the intended audience?) can finish the book satisfied. Interested? Check your local library or read more about it on Amazon. If you're traveling to the Kentucky Derby this year, you're probably prepping for horses, caps and hats and bourbon. But if you've never been to Kentucky's biggest event, there are some things you need to know. It is Derby Home Rentals here you can relax and enjoy your derby rental.